This site features a library of papers on LENR, Low Energy Nuclear Reactions, also known as Cold Fusion. (CANR, Chemically Assisted Nuclear Reactions is another term for this phenomenon.) The library includes more than 1,000 original scientific papers reprinted with permission from the authors and publishers. The papers are linked to a bibliography of over 3,500 journal papers, news articles and books about LENR. The Introduction to LENR-CANR, and a list of books, videos and links to other sites about LENR. A look at experiments: photographs of laboratories and equipment. Special collections of papers, including papers from ICCF conferences, the 2004 DoE review, the Bhabha Atomic Research Centre (BARC) and U.S. Navy authors. The LIBRARY is a collection of full-text papers and books integrated with our bibliography. Storms, E., A Student’s Guide to Cold Fusion. 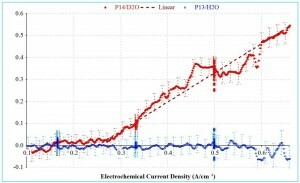 2003, LENR-CANR.org. Revised April 2012. Spanish edition Estudio de la Fusión en Frío, Brazilian Portuguese edition Estudo Fusao a Frio. Russian version Руководство для изучающих холодный синтез. Rothwell, J., Cold Fusion And The Future. 2004. Chapter 1 of this book is a list of Frequently Asked Questions written by Rothwell and Mallove. Also available in Brazilian Portuguese and Japanese. People looking for a quick, easy introduction to the field may enjoy our YouTube video A Brief Introduction to Cold Fusion. You can read the script and learn more about it here. McKubre. Simultaneous Series Operation of Light & Heavy Water Cells; Excess Power vs. Current Density. Click image for details. McKubre, M.C.H., Cold Fusion (LENR) One Perspective on the State of the Science. Proceedings 15th International Conference on Condensed Matter Nuclear Science (Part 1). 2009. See Introduction. Hagelstein, P.L., et al. New Physical Effects in Metal Deuterides. in Eleventh International Conference on Condensed Matter Nuclear Science. 2004. Marseille, France. This paper references 130 other papers. Many are available in our library. See the list in our DoE Review Special Collection. Mallove, E. “Fire From Ice” describes the early history of the subject before 1991. Read selected pages in our library. Beaudette, C. G., “Excess Heat: Why Cold Fusion Research Prevailed” gives an in depth history of the subject up to 2002. Read sample pages in our library. Krivit, S. and Winocur, N, “The Rebirth of Cold Fusion: Real Science, Real Hope, Real Energy” provides another view of the history up to 2004. Read selected pages in our library. Mizuno, T., “Nuclear Transmutation: The Reality of Cold Fusion” describes the experimental work of Prof. Mizuno. Read selected pages in our library. Storms, E. “The Science of Low Energy Nuclear Reaction” describes the experimental work of Dr. Storms and compiles and summarizes most of the experimental and theoretical work in the field up to 2007. Read selected pages in our library. An electronic edition is here.